NOVEMBER 2007 -- Congratulations to the two winners at the Big E for their entries of 5x7 picture frames. The winners were, in the Age 5-8, first prize Fionay Smith and in the Age 9-11, Second prize Hayden Smith. 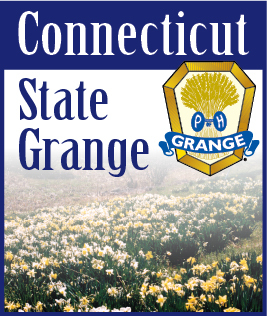 They are both from North Stonington Community Jr. Grange. Great Job!!! The winning picture frames were on display at the State Session. We had a very good State Session. Enough money was collected to buy 216 bike helmets. We also had 12 helmets donated. Thank you everyone who donated money, bought raffle tickets or candy at State Session, or bought hot dogs at Celebration Day. These helmets will be distributed to the Pomona Granges for them to give to their local organizations where there is a need. We had 9 Juniors take part in the Junior program on Saturday afternoon at State Session. That was great. They did a great job. Our new Junior Granger of the Year is Jacob Gervais of Ekonk Community Junior Grange and the Community Service Award went to Ekonk Community Junior Grange. Congratulations go out to all of the Juniors that entered the state contests. We had something entered in each contest. Keep making those posters to welcome National next year. Now we have to start on next year’s program. I hope all of you will take part.